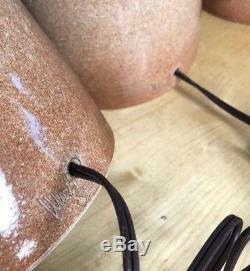 Description: A rare opportunity to own a set of four vintage Mid Century ceramic table lamps with same decor designed by Jane & Gordon Martz of Marshall Studios. Glaze is a nice orange/red with tan underglaze in gloss. All are signed'Martz' near cord. 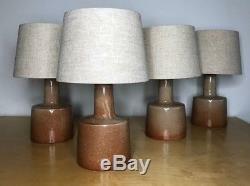 Very handsome Mid Century lamps that come complete with newer shades. 16" to top of shades, ceramic bases are approximately 9.5" x 6.25"; Shade built to factory specs (10" bottom diam, 8" top diam, 7" slant). 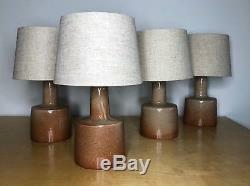 Condition: Ceramic bases in excellent vintage condition with no chips or cracks. There are some variations in glaze across all four, as expected with hand made vintage items. In very good working condition with updated wiring. Newer shades built to Marshall Studios specifications. MY FOCUS IS ON MODERN AND CONTEMPORARY ART AND DESIGN. PLEASE CHECK OUT MY OTHER LISTINGS. In some cases, particularly if we have just auctioned a large number of pieces, it might take us 2-3 days max. 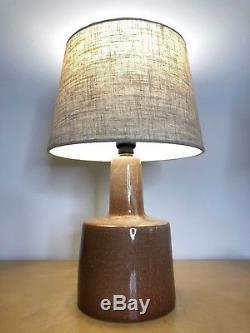 The item "Set of 4 Vintage Jane & Gordon Martz for Marshall Studios Ceramic Table Lamps" is in sale since Saturday, December 29, 2018. This item is in the category "Antiques\Periods & Styles\Mid-Century Modernism". The seller is "ruralcontemporary" and is located in Indianapolis, Indiana. This item can be shipped to United States, Canada, United Kingdom, Denmark, Romania, Slovakia, Bulgaria, Czech republic, Finland, Hungary, Latvia, Lithuania, Malta, Estonia, Australia, Greece, Portugal, Cyprus, Slovenia, Japan, Sweden, South Korea, Indonesia, South africa, Belgium, France, Hong Kong, Ireland, Netherlands, Poland, Spain, Italy, Germany, Austria, Bahamas, Mexico, New Zealand, Singapore, Norway, Saudi arabia, United arab emirates, Bahrain, Croatia, Malaysia, Chile, Colombia, Costa rica, Panama, Trinidad and tobago, Guatemala, Honduras, Jamaica, Barbados, Bangladesh, Bermuda, Brunei darussalam, Bolivia, Ecuador, Egypt, French guiana, Guernsey, Gibraltar, Guadeloupe, Iceland, Jersey, Jordan, Cambodia, Cayman islands, Liechtenstein, Sri lanka, Luxembourg, Monaco, Macao, Martinique, Maldives, Nicaragua, Oman, Peru, Pakistan, Paraguay, Reunion, Viet nam.